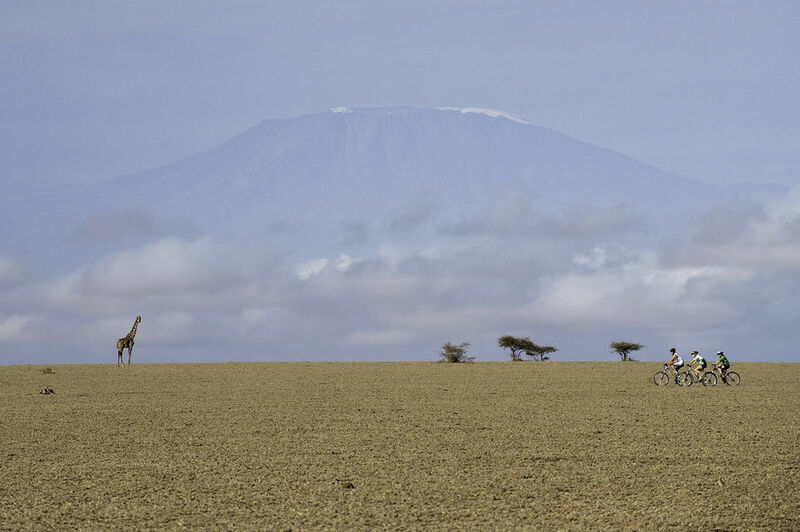 “This could be titled ‘Why I love Kenya’ so be ready for some unabashed positive messages about the country,” says Dereck Joubert, whose ode to Kenya we had to share with you, particularly as queries around the country continue. 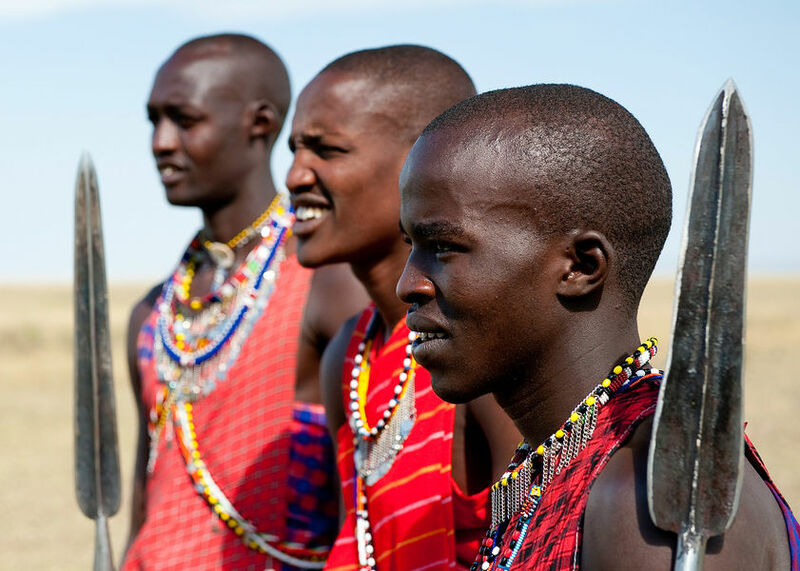 If you’re harbouring any doubt about travelling to this part of Africa, from the Maasai Mara, “a National Geographic film, on steroids”, to the Chyulu Hills, “where the shadow of Kilimanjaro really does stretch across the plains”, let Dereck shed some light on the situation, from the field in Kenya. 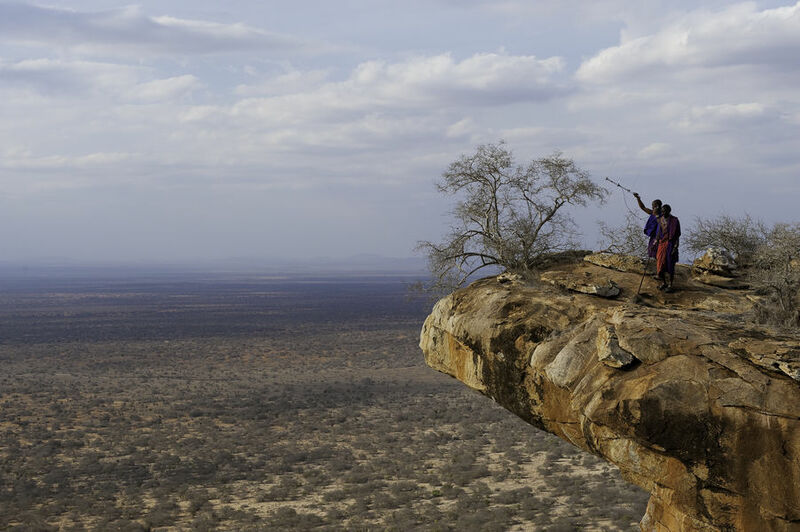 Discover more about Kenya from Dereck and Beverly Joubert in our innkeeper interviews with them, from the field at Mara Plains and Ol Donyo. I keep coming across people who ask me if it’s safe in Kenya, and while at first I was surprised, having lived for some time in Johannesburg in South Africa, later I realized that people are reading the Kenyan situation all wrong. If you hang out in any bad neighborhood bad stuff is going to happen. All of the incidents have been in isolated dark and dingy areas of Mombasa or Nairobi and like most places in the world, there are certain areas you really do not want to wander around it. We caught the underground in New York this month, and ended up in just one such dark and dingy stop at 2am and it was as uncomfortable as in the back streets of Mombasa. 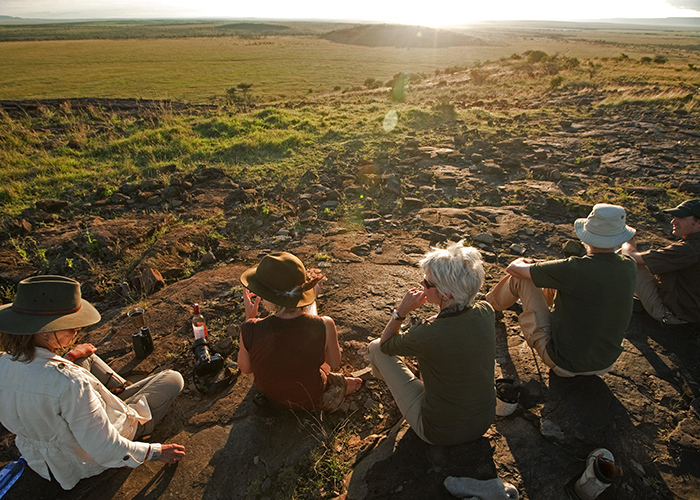 The pristine wildlife camps and high-end lodges are almost like a different world in Kenya. So the first thing I wish people knew about Kenya is that it’s safe in the areas you actually go to Kenya for! 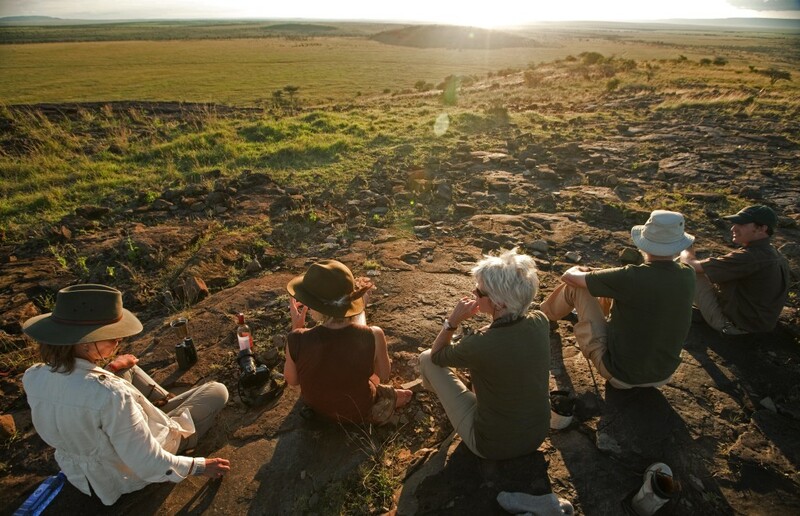 Some safari operations with camps in the Maasai Mara and in other regions now pick guests up at the international airport and whisk them off directly to the bush to start their adventure, avoiding the hustle and bustle of cities, isolating them from any threat. A little magic was sprinkled onto the destiny of Kenya in late 1977 when a group of local women banded together with Richard Leakey and other conservationists and marched on parliament calling for a ban on hunting. 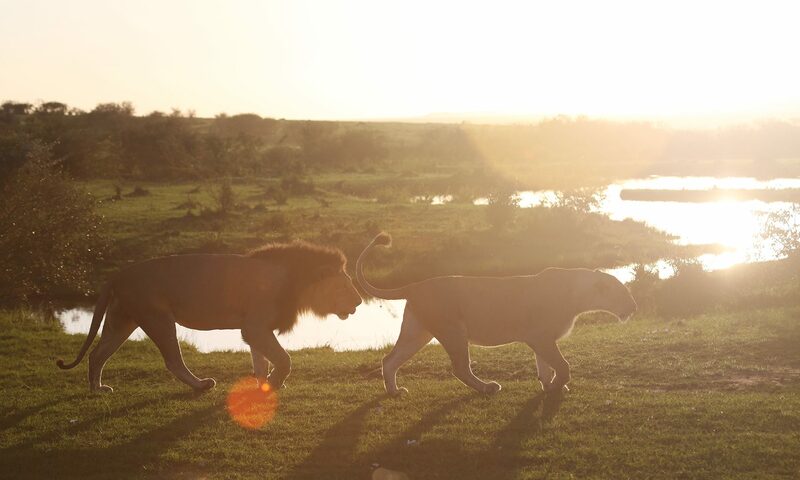 The lion population was in trouble even 37 years ago and today there are fewer than 1,500 in Kenya. But I love the fact that this was the first country in Africa to take a stand like this and make it stick. Some say that wildlife numbers today are lower than when they were back then. The same can be said for just about any wildlife population (except a couple of species that cohabit well with Man: rats and mice, viruses, and bacteria.) In general wildlife numbers decline in proportion to increased human population. 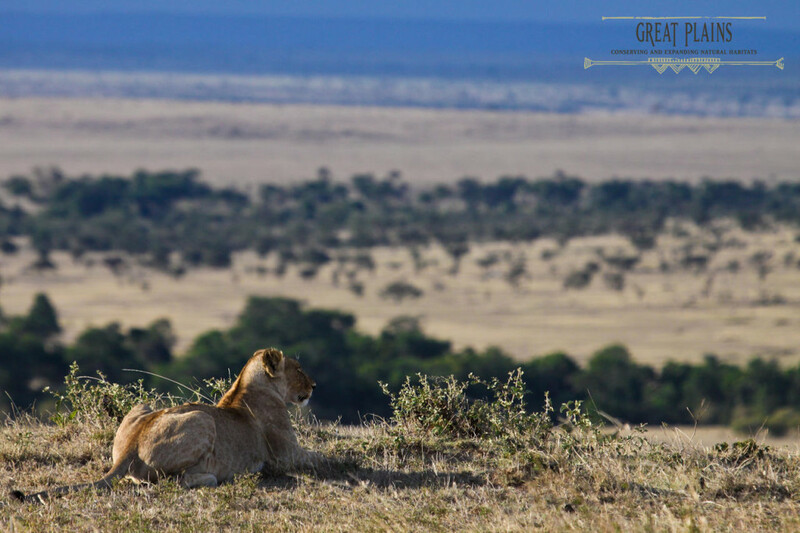 I was sitting on a small hill on the Olare Motorogi Conservancy and mulling over all this recently, and as I scanned around for big cats my binoculars passed over; giraffe, topi, wildebeest, zebra, Thompson’s gazelle, impala, some ostriches, eland, buffalo, elephants, a blur of warthogs, Grants gazelle and finally a pride of lions sitting virtually eye level to me on a far hill. Having found my ‘prey’ I realized that there is probably no other place in the world where one can see this amount of wildlife in one place! The sheer biomass is staggering. 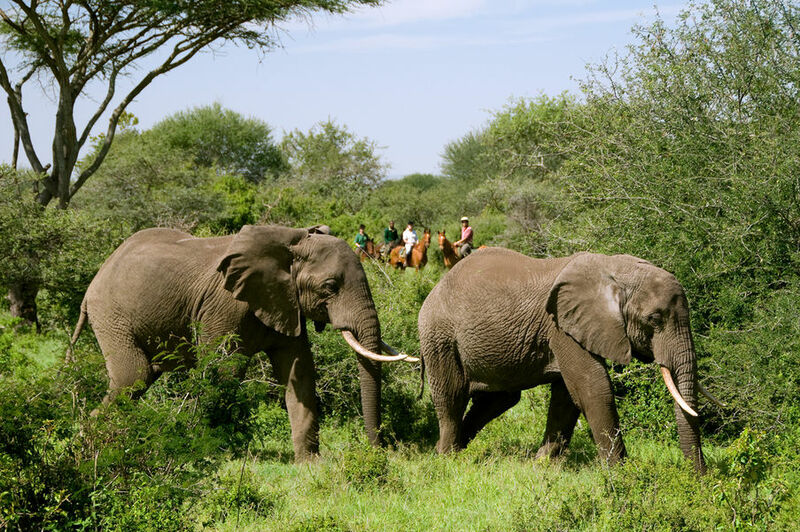 First time visitors to Africa should choose the Maasai Mara because there won’t be a dull moment and it is what the safari is all about: wild animals. It’s like stepping into a National Geographic film, on steroids. And then there is the migration, although I see that more as the moving, bleating, crazy brochure for Kenya that doesn’t need much announcement. Every cable channel around the world has had some kind of film on the poor wildebeest leaping into brown churning rivers that hide giant gnarly crocodiles but for me the Mara is much more about lush green rolling plains that are punctuated with the first steps of a new born Thompson’s gazelle as he stands up, no taller than the average sized camera I use, and these hills further punctuated by a watching cheetah. This wildlife only exist today because of tourism. 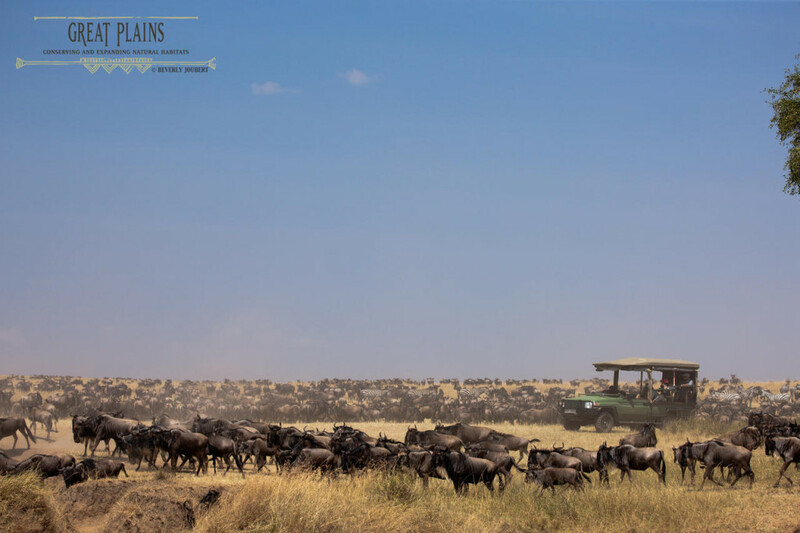 Without the income, cattle would soon overwhelm the Mara and it will be just like any other place in Africa, dry, barren, overgrazed, with a scattering of poverty and sadness. It’s also not just isolated to the Maasai Mara. Last month we got in a small Cessna and flew south from the Mara to Ol Donyo Lodge, out of the lush green rolling savannas that you expect to see if you grew up on Out of Africa, as I did, across the great Rift Valley that holds so much mystique for me. At the foothills of the Chyulu Hills where the shadow of Kilimanjaro really does stretch across the plains I spotted a gerenuk antelope, a weird long necked beauty that stands on its hind legs to reach up to new buds on acacia trees, a surprising animal. I then caught a glimpse of great grey giants. Despite the fact that Africa loses five elephants an hour now, these giants still survive at here, protected to a large degree by the tourism that supports the anti poaching. With tusks reaching down to the ground and with names like One Ton and Unbelievable, elephants that come from ancestors with a tradition of names like “He who Ploughs the Earth” are valued representatives of an elephant population that cannot be seen anywhere else in the world. They represent the elephants that once where, the stories of our childhoods, the memories of a time when giants ruled this continent from coast to coast and ploughing the earth with gleaming ivory. 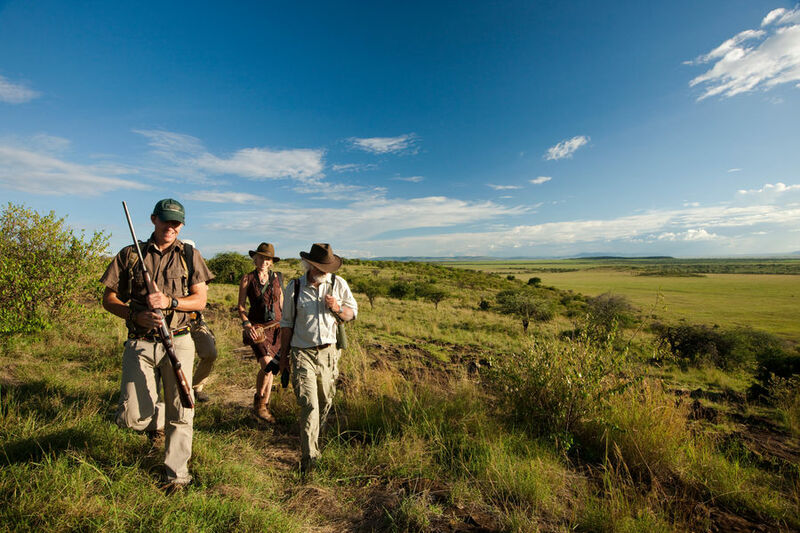 An anti-poaching force run by the Big Life Foundation of over 270 rangers patrol and secure 2 million acres of land. People should know that there is a battle for Africa going on and it is being fought on three major wildlife fronts: lions, elephants and rhinos. In Kenya we help fund the Predator Compensation Fund (under Big Life) by paying fair value for cows killed by lions and Maasai warriors have agreed to stop spearing lions. It’s a major coup. The warmth of a warrior’s smile one day, a six foot tall man in red checked robes with beads and spears and swords is something I will not forget but when he told me that real warriors don’t need to kill lions anymore, my heart swelled with pride, compassion and a sense of shared hope. A few years ago, an electrical fire burned down most of the international airport. Like a few thousand other people we were trying to fly out and I was struck by the kindness and willingness of officials to help, to direct and just be good at making the best of a smoke filled bad thing. When we handed in our passports, and said: “Tough day?” she looked up at us and smiled, “Could have been much worse.” And I took this to be the attitude of Kenyans in general. Innovation, passion, that frontier spirit, huge tusker elephants, lions in the largest density known to scientists, weird long necked antelope, deserts and mountains. Mostly what I would like people to know about Kenya is that it fulfills dreams, against all kinds of odds. Those dreams only exist on a warm bed of tourism. 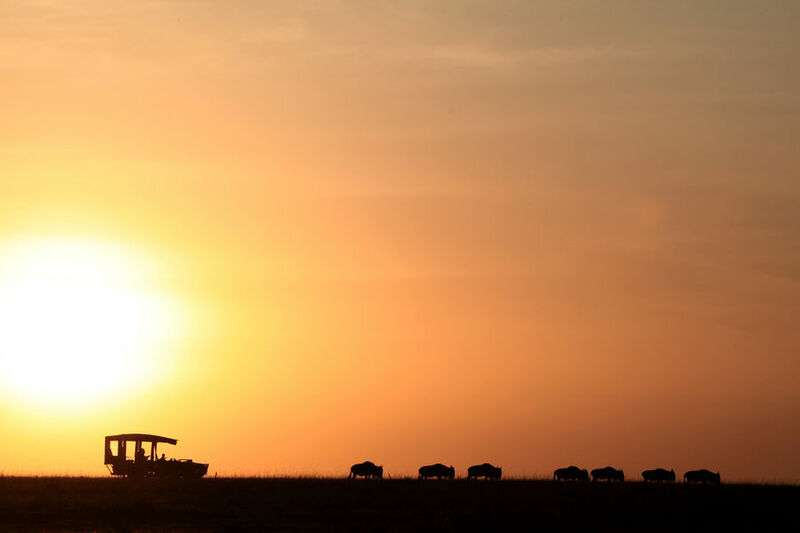 Have you been on safari in Kenya? Let us know what you love about this part of Africa and to discover the Jouberts’ Kenya, we recommend Mara Plains and Ol Donyo. Everything has a story. Every story has its characters. You might recognise the title of this story from one by Alexander McCall Smith. But these characters are something wholly unique. I’m sure McCall Smith won’t mind us borrowing his title; because while no less distinctive, the women who feature in our tale today, set on the banks of the Zambezi River in Zambia, are just as bold, their stories just as courageous, as those that feature in the celebrated author’s tales of Botswana. And as far as cheerful ladies go, they are the definition of cheer. Our definition: Patience, faith, optimism. And greenfingers. We arrive at the Mushekwa village, a short boat ride downstream from Royal Chundu. 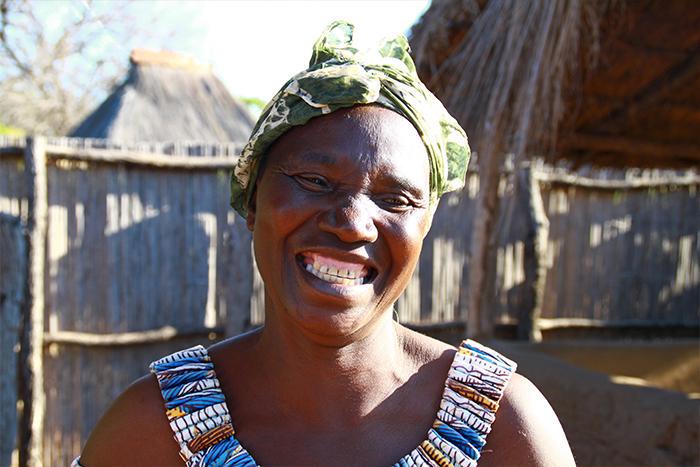 There has been a passing of an elder in the village, but instead of turning us away, matriarch, the mother of Mushekwa, Edith Mushekwa, whose father founded the village, calls us to the riverbanks with her waves and that smile that takes over her whole face. That comes from her whole heart. Edith is one of the characters of this story, the humble protagonist you could say. She walks with us, through the community veggie garden. 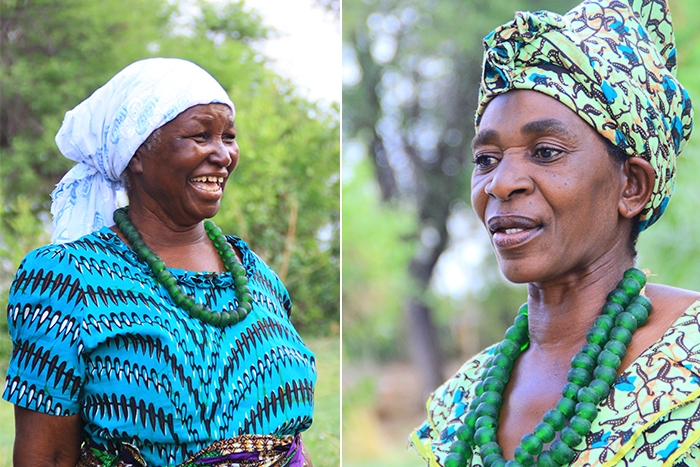 The maize, eggplant, tomatoes and cabbage that grow here depend on a woman’s touch to thrive, on Edith and the other ladies of the village. They’ve been away, seeing to a funeral, and the crops have wilted without the company of their cheer. Edith tells us she is trying to get the kids in the village more involved. Kids will be kids wherever you are in the world. Royal Chundu donates seeds to the villagers, who in turn grow the crops and sell them back to the lodge for an income. 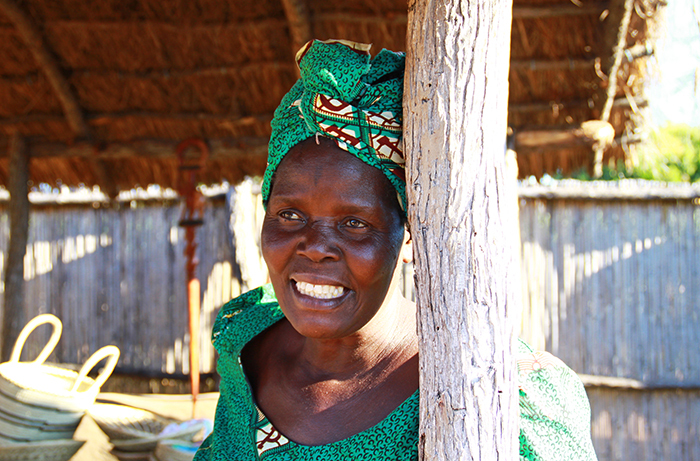 The garden also feeds the village and guests at Royal Chundu. Many of the plants are used as medicine, such as moringa, which treats a range of different ailments, including HIV. It will take time, birthing new greenfingers, but until then the Cheerful Ladies are in charge. I know, when I return next, as I have before, the garden’s crops (organic, fresh and tasty) will tower over the walkways between them, with tens of little hands sharing Edith’s touch. A similar project between lodge and village is at play with the bream fish breeding project set in a large lily pond at the entrance to Royal Chundu. The fish are released into the Zambezi River, and, after time, the local fishermen catch them to sell back to the lodge. Edith and two more ladies – Bettina and Josephine – guide us through the village, their long dresses sweeping the earth, their amble slow and strong. The Cleopatras of Zambia. Zambezi River Pharaohs. The owners of those future greenfingers trail after us, as the scene of our story is set, as the senses are called upon. A fire burns somewhere close by; an African fish eagle circling above calls out in competition with the chickens in their roost. 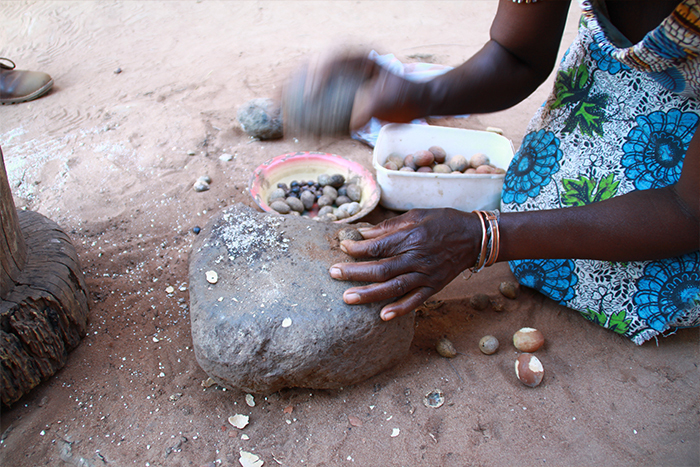 Edith holds up a small brown nut for us to taste, the nut of the manketi tree, a nut they grind for oil. Further on, beneath a reed canopy, a modest market has been set up. Here we meet up with the other ladies (the men are out fishing). 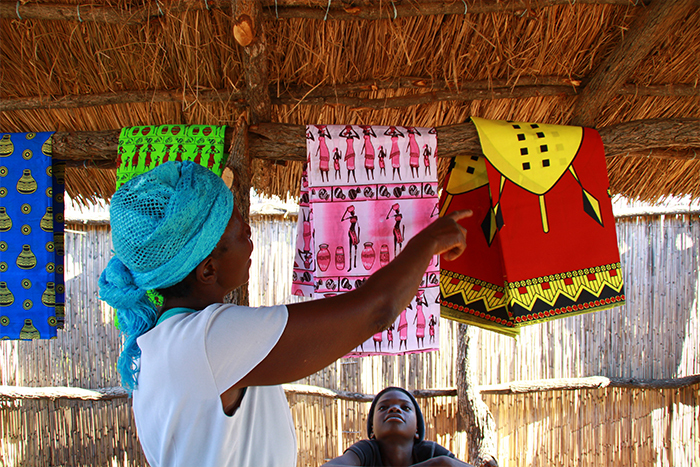 The beautiful handmade Chitenga cloths that wrap around our leading ladies are draped before us – the colours of Zambia, the patterns of the nation starring alongside carved wooden animals, bracelets, mats and baskets for us to purchase. This is daily life in rural Zambia. 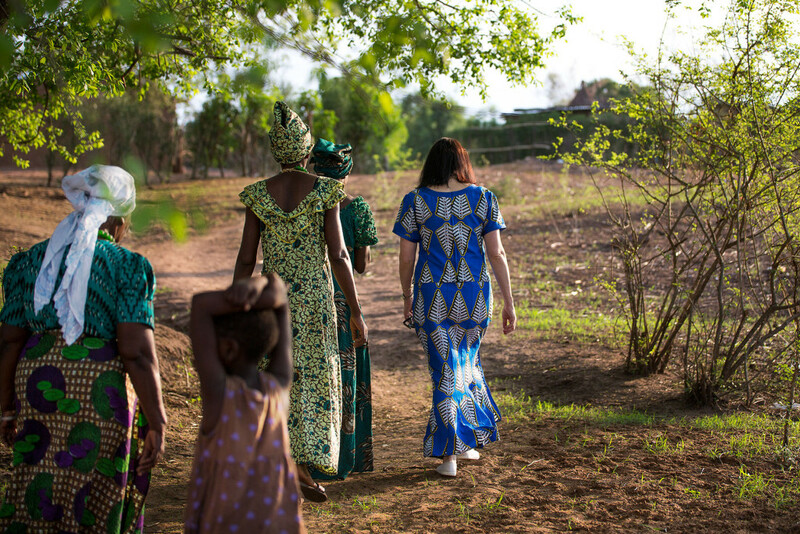 This is how a team of ladies supports a village. Being in their company, you can see it takes something more, however. It takes a big heart, a light heart, and unwavering patience, faith and optimism. That’s what cheer is… patience, faith and optimism. (And greenfingers.) And here, it’s a cheer that doesn’t stop at Edith, Bettina and Josephine. 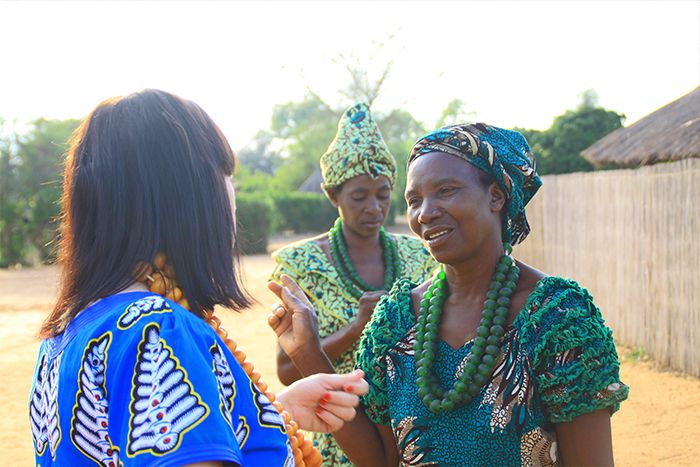 Experience the Company of Cheerful Ladies for yourself at Royal Chundu, on the banks of the Zambezi River in Zambia, upstream from the Victoria Falls. 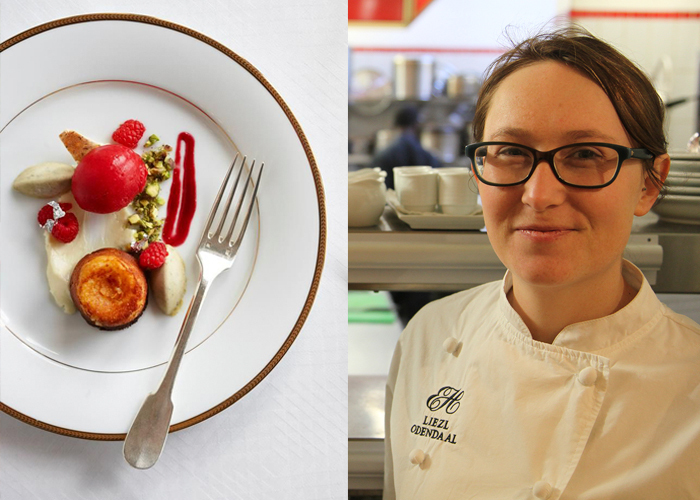 Britta Dahms of Ellerman House sat down with the hotel’s celebrated Pastry Chef to find out where she draws her inspiration from and what ingredients she keeps in her kitchen. EH: Where did you study and where was your first experience as a Pastry Chef? 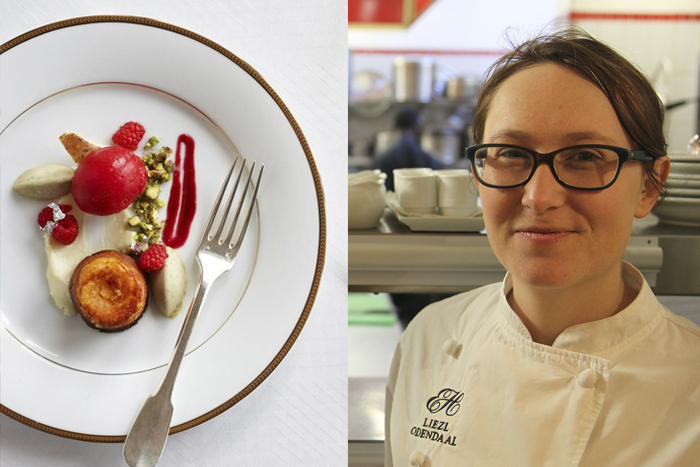 Liezl: I studied at the Institute of Culinary Arts in Stellenbosch and my first job as a Pastry Chef was at La Colombe. 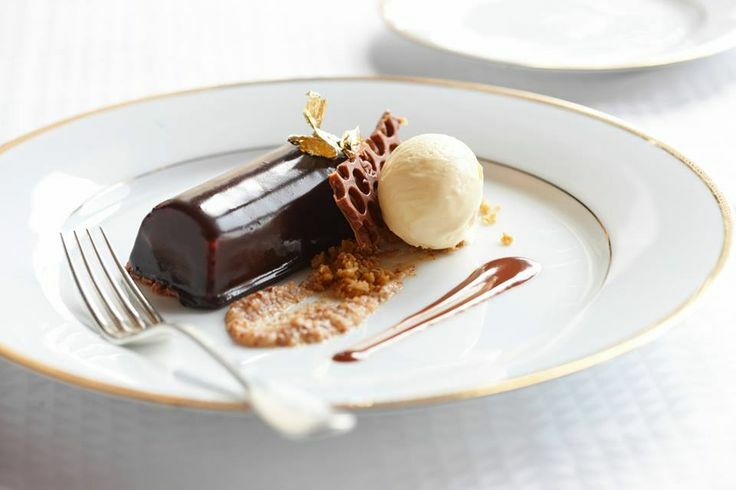 EH: Do you think being a great Pastry Chef is a talent you are born with or can it be learnt? Liezl: I would say both, you need talent but you always need to evolve, learn better techniques, work harder, be more creative and find new ingredients and ways of using them in the kitchen. 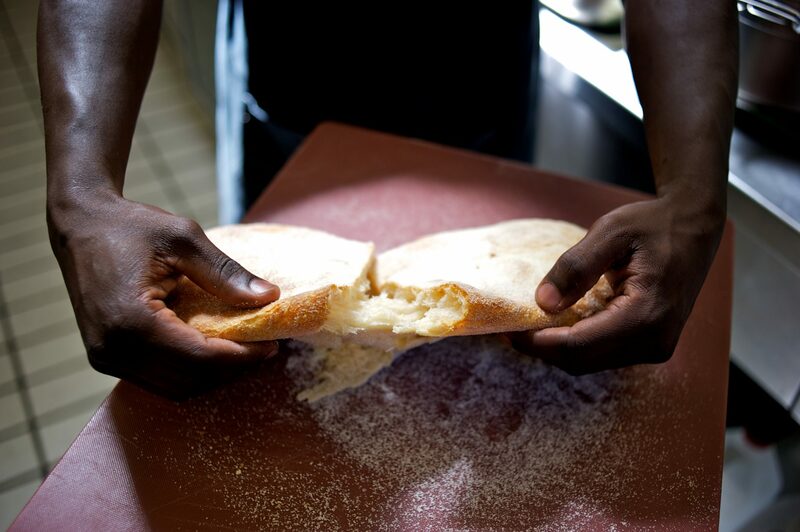 EH: What tips would you give those aspiring to become a Pastry Chef in South Africa? Liezl: Working hard will top my list of tips, but together with that you need to surround yourself with chefs that inspire you and teach you to be better. EH: Where do you draw your inspiration? Liezl: I read quite a lot of books from other amazing Pastry Chef’s around the world, new cuisine products and travelling. 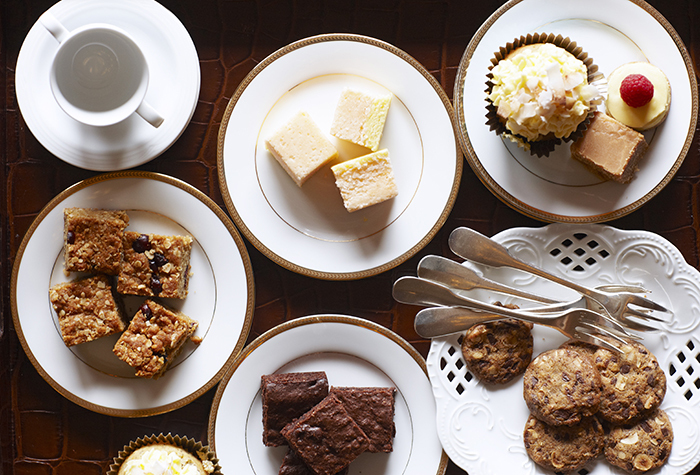 EH: Which Pastry Chefs have had the biggest influence on you? Liezl: There’s a Pastry Chef in Paris, France, Pierre Hermé. He made the humble macaroon famous and he has amazing pastry shops dotted all over Paris. He takes classic pastry and creates a new and modern version. 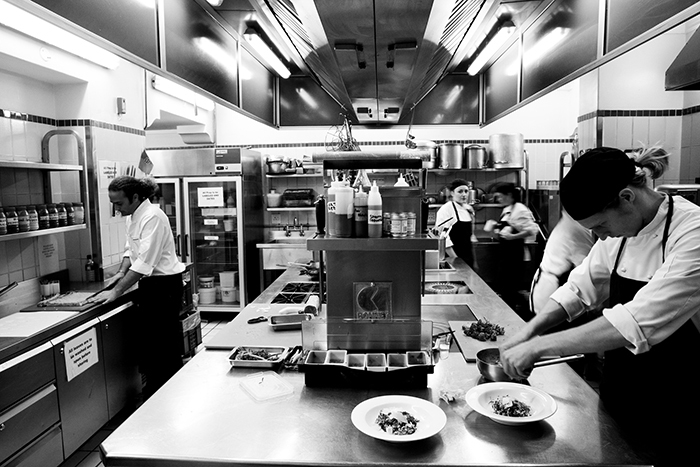 EH: How important is the relationship between the Head Chef and the Pastry Chef? Liezl: I think it is an important aspect in any kitchen. The Head Chef and Pastry Chef always need to be on the same page regarding the menu. EH: What do you love about working at Ellerman House? Liezl: I love working with the team of chefs currently at Ellerman House. We are a very small team, which makes us close, and we constantly learn new things, as every day is different and interesting. EH: Do you have a favourite pastry to make, and what is it? Liezl: I don’t really have any favourite but if I had to choose it would probably be Pasteia de Nana because I’ll most likely eat the entire batch after it comes out of the oven. EH: Do you have an inspirational quote to live by? EH: What three ingredients do you always have in your kitchen at home? Thank you to Liezl for letting us into her mind and kitchen for a day.